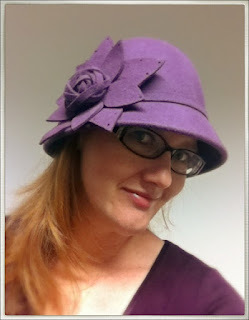 I mentioned I bought a new hat at the South Melbourne markets on our night away. It has not been easy to get a good photo. Mr Owl and I tried this morning but it was too dark and overcast. The best I could do is here at work. What do you think? It is 100% wool felt and my favourite colour! Very cute! Love a pretty hat.